When you wake up here in the morning and look across the beautiful marsh from the holiday house, you might very well see an unusual bird alighting on the water or spot a heron hidden among the reeds. For breakfast you can stroll to your own little waterside terrace to enjoy a meal surrounded by nature. With its high-quality finishes, this fully detached holiday bungalow is designed to emphasise the sense of space and is a wonderful place to really unwind. 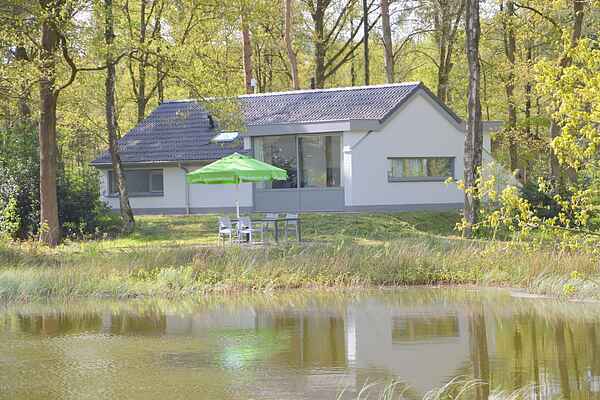 The small-scale holiday park where you will be staying, 't Vosseven, is ideal for a holiday with a young family and nature lovers. The park is situated in the middle of Kempen-Broek nature park. You can explore this area on hikes and bike rides. There are 10 different hiking trails for a total distance of 104 km. Vijvers de Luysen is about 5 km from the park, just across the border in Belgium. This is an area with lots of open water and from the viewing hut you can watch ducks and migratory birds, which use this area as a rest stop on their southward or northward migrations. Want to make the most of your holiday in Limburg? How about shopping in Roermond with its well-known outlet centre? And the cities of Maastricht, Aachen and Mönchengladbach are just an hour away.